As spring draws near, it seems as though our tastes all migrate towards the light and pretty. Don't we all want to try and hurry mother earth along just a tiny bit with our lipstick, clothing, or food choices? I know that as soon as March hits, my kitchen becomes less of a soup-factory, and more often than not, cupcakes, pies and cookies line the counters. 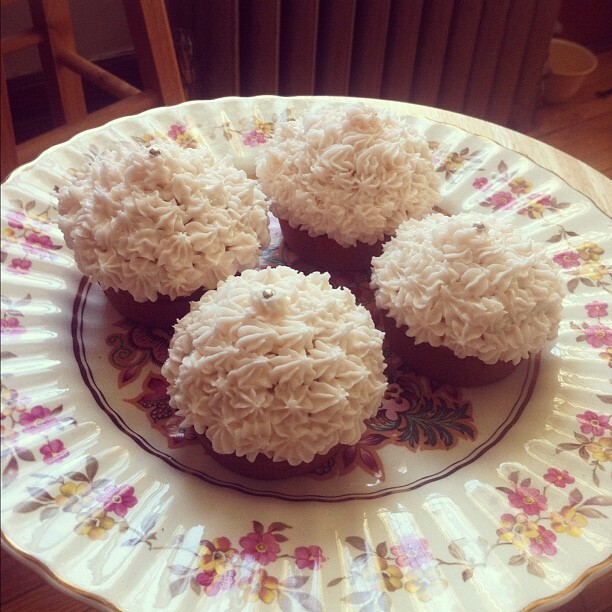 I'd love to share one of my favorite spring treats, cardamom cupcakes with rosewater frosting. Cardamom and Rosewater are a flavour match made in heaven, and cupcakes are the perfect catalyst for such a combo. Preheat oven to 350°F. Grease up your cupcake pans, or get your cupcake liners in place, whichever you prefer. I find cupcake liners a bit wasteful, but there's something about peeling that liner to expose a soft, fluffy cake that just can't be beat. In a medium bowl, (or the bowl of your electric mixer if you're so inclined) At about medium speed, beat together butter, sugar, and cardamom until light and fluffy. Add eggs, one at a time, and beat the whole thing well once more. Sift in flour and baking powder in batches, until just combined. Fold in your milk with a spatula, or mixer on low. In a bowl, beat butter until light and fluffy. Slowly add in icing sugar, about ½ c. at a time, until just combined. Beat in milk, rosewater, and food colouring if desired. After the cupcakes have cooled sufficiently, **Remember, if you haven't cooled your cakes long enough, that lovely frosting will slip right off into a big melty mess** FROST AWAY!! Now, I iced the cupcakes above with a piping bag and star tip, but feel free to just slather it on in a haphazard fashion. I promise they'll taste JUST as good.